PORTLAND, Ore. (CN) – On the 47th anniversary of the mysterious skyjacking done by a man known to the world as D.B. 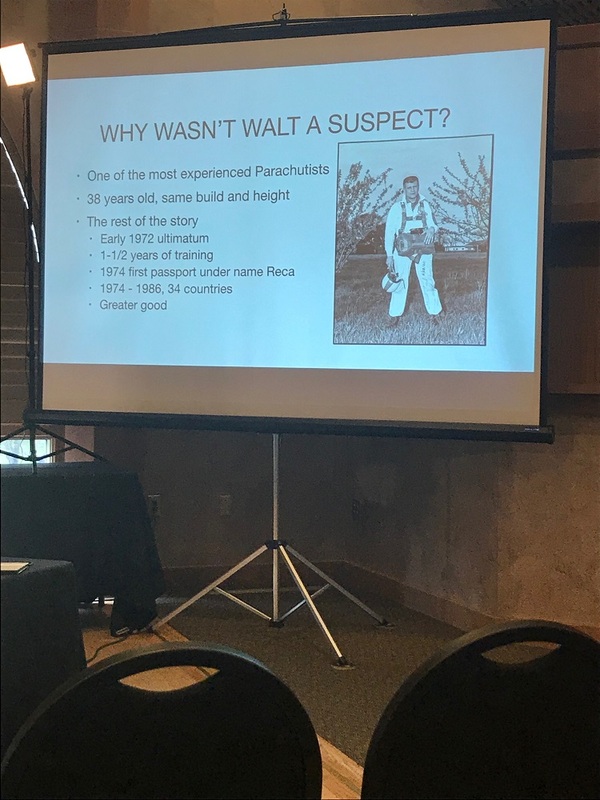 Cooper, investigators and enthusiasts gathered to discuss and debate the true identity of the subject of FBI’s most famous unsolved case. Though FBI stopped actively investigating the case in July 2016, that has not dampened the enthusiasm of professional and amateur investigators who have their own theories about Cooper’s identity. The story is well-trodden, but nonetheless incredible. The day before Thanksgiving in 1971, a middle-aged white man with a briefcase signed his name “Dan Cooper” to buy a one-way plane ticket from Portland to Seattle. During the flight, Cooper (later mistakenly dubbed “D.B.” in the media), handed a flight attendant a note informing her that he had a bomb in his briefcase. He wanted $200,000 in “negotiable American currency,” four parachutes, and for the plane to be refueled when it landed. The other passengers were informed that a “minor technical difficulty” would cause a delay in landing, as the flight crew informed authorities on the ground. Upon landing, the others left the plane, while Cooper remained on board and continued negotiations. Cooper wanted the flight to head south to Mexico, but he did not appear to have any sort of political agenda. Around that time, skyjackings done for political purposes were quite common. After securing the money and parachutes, the plane took off. And somewhere over southern Washington state, Cooper jumped out. His whereabouts remain unknown. 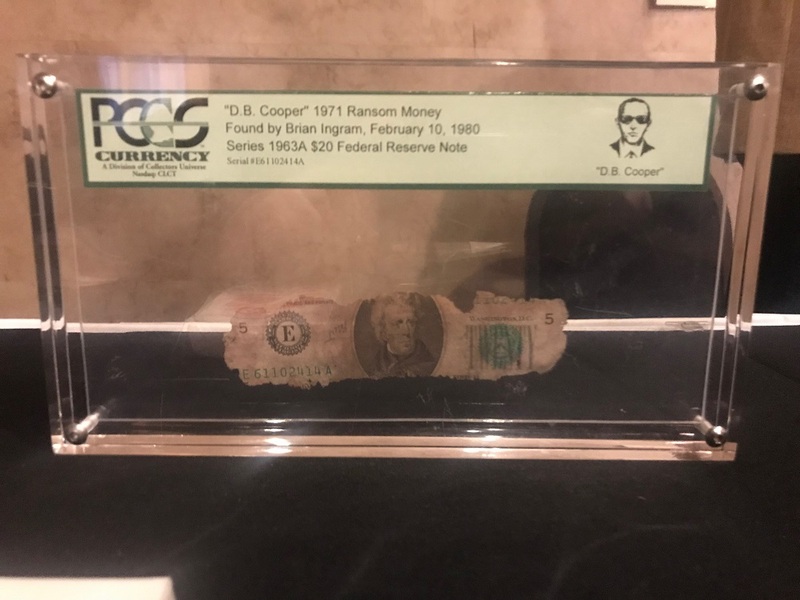 In 1980, a young boy found $5,800 of the ransom money on the shore of the Columbia River – to date, the only confirmed physical evidence that has been discovered in the case. Since the skyjacking, citizen sleuths and enthusiasts who call themselves “Cooperites” have eagerly investigated, written about and debated their theories. But who was D.B Cooper? A disgruntled pilot? A skydiver settling a bet? Maybe a swindler who called himself a wealthy Swiss baron? On Nov. 24, the anniversary of the skyjacking, some of the most prominent investigators gathered to discuss the real identity of Cooper. With varying degrees of certainty, many who believe Cooper survived the fall have a specific person in mind that they believe was responsible. And in the afternoon at the D.B. Cooper Conference, a group of about 50 Cooperites heard theories about three suspects. 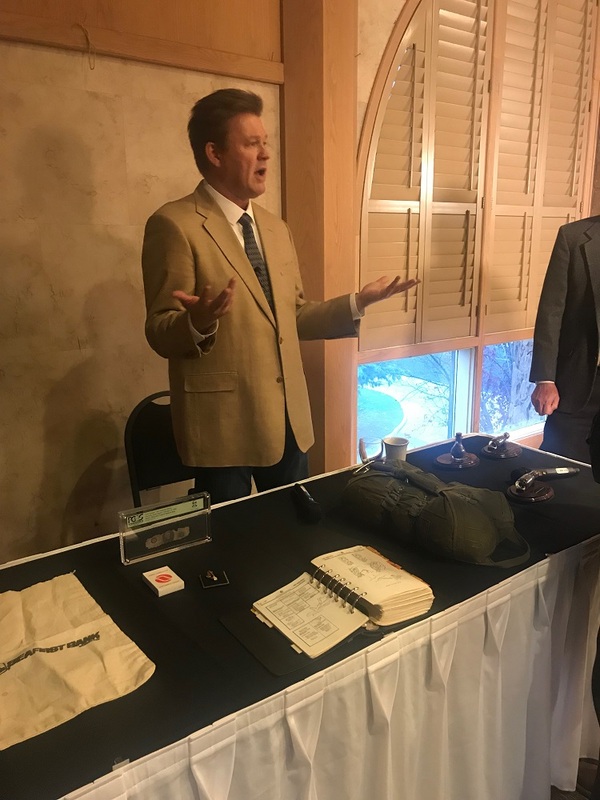 While many of the Cooperites in attendance are old enough to remember the event, others learned about it more recently. 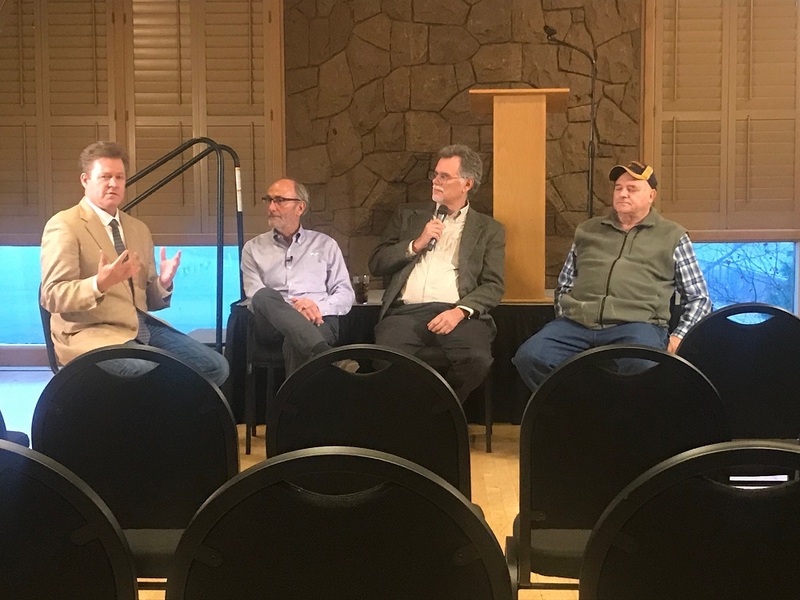 Schaefer, who came to the conference from Boise, Idaho, said he consumes most of his media in podcast form and was disappointed in the available podcasts about the Cooper case. The goal of Schaefer’s podcast, he says, is to provide a “microphone” for Cooperites in a non-confrontational manner. Perhaps the most prominent and most confident Cooper investigator is journalist and film producer Tom Colbert, who sued the FBI to reopen the investigation. He was unable to make the conference, but several members of his team attended to discuss the seven-year private investigation. Colbert has garnered the most Cooper-related headlines in recent years with his claims that former U.S. Army paratrooper Robert Rackstraw is the real D.B. Cooper. “Why hasn’t he sued me for defamation?” Colbert asked in a letter that was read aloud to conference attendees. Pete Roscoe, a restaurateur from Astoria, Oregon, recounted the story of a con artist “Swiss baron” who spent time in the town in the months before the skyjacking. Roscoe believes that man, who went by the name “Norman de Winter,” was actually Robert Rackstraw, aka Cooper. “Whenever Norman was around, nobody saw Rackstraw, and vice versa,” Roscoe told the audience. De Winter befriended people in the port city and promised them private airplane rides to his Swiss chalet from “a big payoff at Thanksgiving,” Roscoe recounted. Vern Jones, publisher of Principia Media, has a different theory: D.B. Cooper was actually a paratrooper from Michigan named Walter Reca. 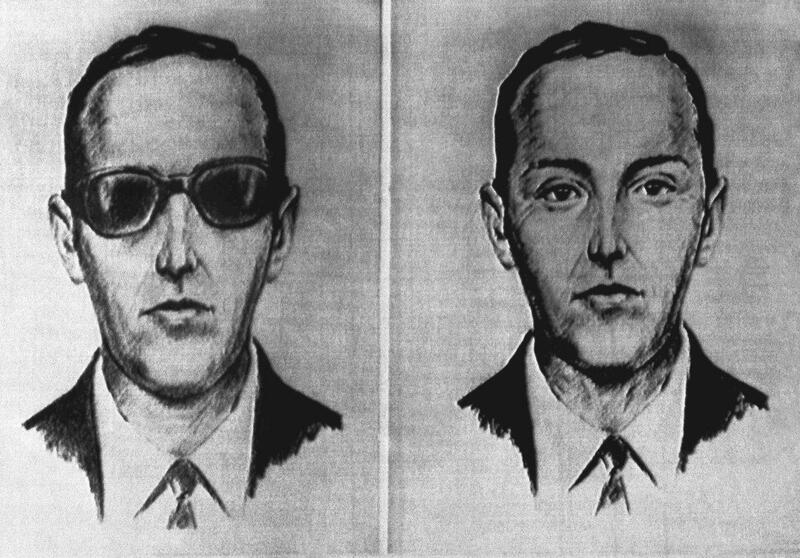 Reca allegedly confessed to his best friend that he was D.B Cooper, and he had done the skyjacking out of desperation. Jones recounted his theory to attendees in a 45-minute talk, laying out his case that Reca, who died in 2014, was the mystery skyjacker. Over the course of 14 years, Reca allegedly confessed how and why he hijacked the plane, and how he got away with it. 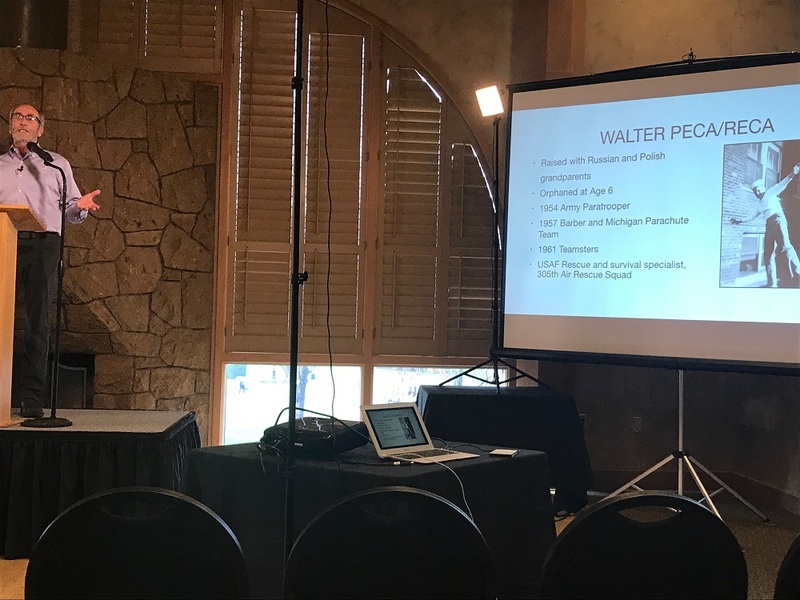 Conference organizer Eric Ulis has a suspect of his own: 92-year old Sheridan Peterson, a smokejumper who once worked for Boeing. The FBI interviewed 1,500 potential suspects in the case before closing the investigation. Ulis counts himself among those who believe the real D.B. Cooper is on that list. Sheridan, whom Ulis described as “cantankerous,” does not have a satisfactory alibi for where he was the day of the skyjacking, and has insider knowledge that only the skyjacker would know, Ulis said. The FBI first interviewed him as a suspect in 2003. In a panel closing out the conference, participants shared their thoughts about the enduring appeal of the Cooper case. “It’s kind of like a Robin Hood story, if you forget about the part where he gives back to the poor,” Vern Jones said. Except for the emotional damage done to the flight attendant on the plane, there was no real victim of Cooper “other than the insurance company,” Jones said. In an interview, author and Cooper researcher Bruce A. Smith said Cooper’s apparent knowledge of flight paths and planes was a “major clue” in the case. He said it’s plausible to assume that he had contacts within the military. It’s even possible that “the pilots concocted this,” and that the skyjacking was a false-flag operation to federalize airline safety, Smith said, though he did not endorse that theory as fact. “The pilots knew they there going to get [someone like] Cooper sooner or later,” Smith told Courthouse News, referring to the wave of skyjackings at the time. Between 1968 and 1972, a skyjacking took place almost once a week. Like the 9/11 attacks years later, the Cooper skyjacking inspired changes in airline safety regulations. Asked if he had a preferred suspect, Smith said he doubts that the real Cooper is any of the people named at the conference. “If I had to make a bet, I would say when we find out who D.B. Cooper is, everyone’s going to say ‘Who’s that?’” Smith told Courthouse News.